SAN NARCISO, Calif. (Bennington Vale Evening Transcript) -- So-called “wunderkind” Martin Shkreli, a 32-year-old hedge fund manager, was already a controversial and polarizing figure in the world of pharmaceuticals. His deranged antics against a former employee became a social media and legal horror show a few years ago. And Monday, Shkreli stunned the nation up to its highest levels when he led his company, Turing Pharmaceuticals, to raise the price of a life-saving drug by more than 5,000 percent. Despite the public outcry and swift responses from Democrats like Hillary Clinton, Shkreli has become a GOP darling overnight. But who is this enigmatic, pitiless and depraved young cutthroat? Daraprim, the drug in question, is used to treat toxoplasmosis, a condition caused by a parasite that affects nearly 25 percent of the U.S. population over the age of 12. It’s particularly deadly to unborn children and people with autoimmune diseases such as AIDS. Daraprim is essential to their survival, but now these vulnerable victims will be expected to shell out $750 a pill, up from $13.50. Unfazed by the negative press and political outrage, Shkreli took to social media to laugh it all off. “I think it’s ironic that I named my new company after a gay scientist and now I’m about to kill a bunch of people with AIDS,” he tweeted Tuesday morning before Twitter removed the post. Meanwhile, Republican White House hopefuls rallied to defend the pharma company’s brash young superstar. Many urged lobbyists to begin pushing drug makers to implement similar increases for other medical mainstays: aspirin, insulin, penicillin, birth control, albuterol and epinephrine. Despite his youth, Shkreli has performed in this rodeo before. In 2014, while still serving as CEO of Retrophin, Shkreli acquired the rights to Thiola -- a drug instrumental in the treatment of an incurable kidney disease -- and attempted to raise its price 20 times over. The board fired him and then sued for $65 million, citing misuse of company funds. Prior that, Shkreli had notoriously hounded former employee Timothy Pierotti in a bizarre, stalkerish intimidation scheme that involved hacking Pierotti’s email, texting his wife, messaging his children on Facebook, and reaching out to family friends and relatives. “Your husband had stolen $1.6 million from me and I will get it back. I will go to any length necessary to get it back,” Shkreli wrote to Pierotti’s wife in a January 2013 letter, according to court documents. “I hope to see you and your four children homeless and will do whatever I can to assure this,” he also threatened. Shkreli’s accusation that Pierotti had stolen Retrophin funds basically boiled down to the argument that “we paid this guy a big salary and gave him stock options to do his job, which we hoped would result in more business. It didn’t, so we feel he should give us all that money back.” Eventually, police were called in and the company had to settle quietly out of court in 2014. Although Shkreli maintains a low profile where his personal life is concerned, those closest to him confess that he’s exhibited an ongoing pattern of disturbing behavior since his toddler years. 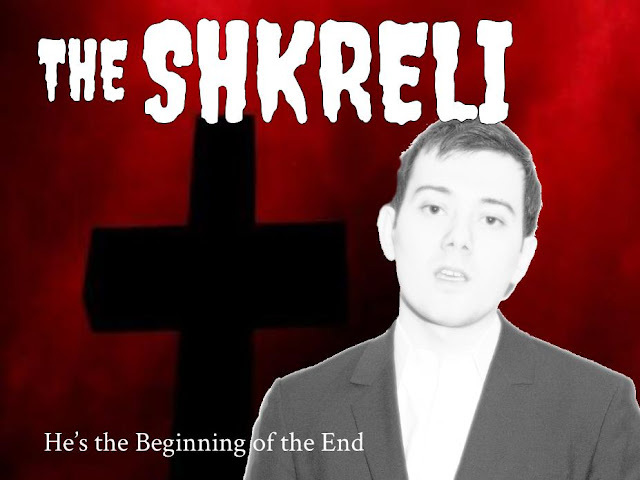 Based on the testimony of various school mates, neighbors, sitters and teachers, we have attempted to compile a profile of Martin Shkreli -- an odd, somewhat alien and always ghastly creature. Shkreli is an Albanian-American entrepreneur, the child of working-class parents from Albania and Croatia. According to former students and neighbors, mysterious events plagued Shkreli wherever he went. For example, large Rottweilers were usually found congregating around his house, or gathering near the playgrounds and parks where he played. Other animals, however, seemed positively terrified by his presence. Shkreli’s kindergarten teacher recalled a doomed field trip to the zoo, where many of the primates became riled and agitated when the boy stood near their enclosures. When aggressive behavior of the baboons turned violent and reached uncontrollable levels, the class was forced to cut the educational visit short. Zoo employees noted that immediately after Shkreli vacated the grounds, order was restored. The circumstances surrounding Shkreli’s birth seem equally surreal. The private investigators we spoke to from San Narciso’s Few and Shue Security Services question the haunting circumstances of Shkreli’s delivery. “Most of the birth records were destroyed when an inexplicable fire engulfed the hospital around 1985,” said Charles Bowldentine, the firm’s lead detective. Bowldentine, through interviews with former staff and sources close to the arson case, believes he’s found evidence to support a theory that the Shkreli’s actual son died in birth -- and that a former priest who worked at the maternity ward convinced the couple to adopt an orphaned infant in his place.